Since version 0.24.0 SUMO includes a model for electric vehicles. It was implemented by Tamás Kurczveil and Pablo Álvarez López from the TU-Braunschweig. The core of the model is implemented in the vehicle device device.battery. Additional features are a charging station (which can be placed on any lane in the network) and a new output option --battery-output <FILE>. To define an electric vehicle, it must be equipped with a battery device. This may be done using the option --device.battery.explicit <vehID1,vehID2,...> or simply setting --device.battery.probability 1 to equip all vehicles. 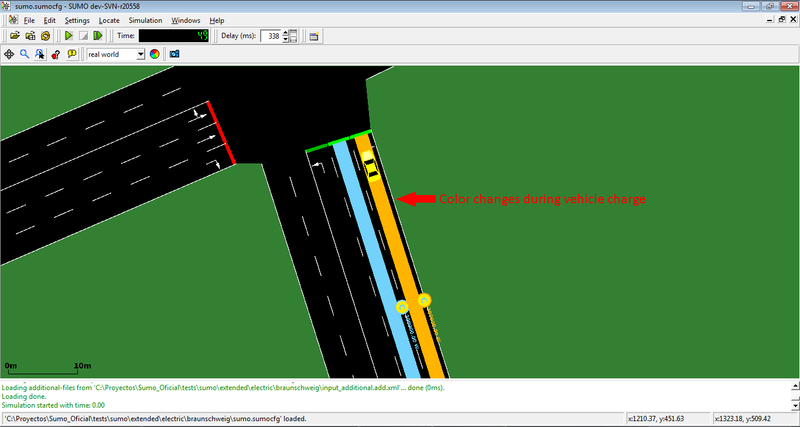 Alternatively, the device may be specified using Generic vehicle parameters. Additional properties of the vehicle and its electrical components must then be defined via parameters of the vehicle or its type. A charging station is a surface defined on a lane in which the vehicles equipped with a battery are charged. The basic structure and parameters of bus stops were used for the implementation of charging stations. name string simple String Charging station name. This is only used for visualization purposes. <vehicle id="vehicle01" Consum="0.00" actualBatteryCapacity="17500.00" maximumBatteryCapacity="35000.00"
speed="12.92" acceleration="0.00" x="1428.27" y="25.57" lane="01to02_0"
The Emission model-outputs of SUMO can be used together with the battery device when setting the <vType>-parameter emissionClass="Energy/unknown". The internal state of the battery device can be accessed directly using traci.vehicle.getParameter and traci.vehicle.setParameter. Furthermore, the function traci.vehicle.getElectricityConsumption() can be used to access the consumption of the vehicle if the emissionClass="Energy/unknown" is declared..
All information about the implemented device (including details on the vehicle energy consumption and charging model) can be found in the following publication.